This article was originally published in Mondo e Missione magazine, written just before Pope Francis’ visit to Mexico in February 2016. The first PIME Missionaries set foot in Mexico in 1895 and worked in the diocese of La Paz, in the State of Baja California until 1926. After a hiatus of almost seventy years, the PIME Missionaries again opened a mission in Mexico in 1993, but, this time in the State of Guerrero. Presently, seven PIME priests work in this part of the Lord’s vineyard. They are: Msgr. Luigi Maggioni and Fr. Francesco Bonora in Acapulco; Fr. Domingos Tchuda, who is in Mexico City to learn Spanish; Fr. Giovanni Manco and Fr. Ferdinand Kouadio Komenan in La Concordia; and, Fr. Damiano Tina and Fr. Deodato Mammana, who are preparing to open a new mission in the Diocese of Ecatepec in the State of Mexico. These seven missionaries concentrate their apostolic efforts ministering to indigenous ethnicities and to people living on the outskirts (or peripheries, if one wants to use the term preferred by Pope Francis) of large cities. The La Concordia mission is made up of 34 villages scattered over the mountains of Guerrero. The missionaries working here know they have to cover endless miles on backbreaking dirt roads to get to them during the dry season. In the rainy season, the ruts on these impossible roads take a heavy toll on their backs! The children are exposed to the Spanish language only as they get into middle school. For the rest of the villagers, it is a completely foreign language. Hence, our missionaries know that, however polished and well-delivered their homilies in Spanish might be, those who can understand what is preached are few indeed! The language barrier makes us realize we must immerse ourselves in their culture. The two of us working in the diocese of La Concordia have taken on the serious study of the Mizteco language, which is crucial for the preaching of the Gospel. We are determined to talk to our people about Jesus in the language that they all understand. It won’t be easy, but, with God’s help, we will succeed. We have already printed two grammars of the Mizteco language and are deep into the translation of the missal. On the feast of St. Juan Diego, the Indian the Blessed Mother appeared to at Guadalupe, we celebrated the Holy Mass in Mizteco for the first time. At the end of the celebration, some were telling us they could understand. The PIME Missionaries who formed us in the seminary warned us that, as long as people tell us they understand, in reality, they are just being encouraging and have understood very little, if anything. Mindful of this humbling truth, we realized we have our work cut out to make our liturgies understandable and appreciated by the indigenous people we want to serve. So we decided, on the ninth day of each month, Holy Mass will be in Mizteco. We will learn from our mistakes, and improve through perseverance. In the near future, our group of intrepid missionaries will open a new mission in the Diocese of Ecatepec. There they will work in an extremely dangerous environment. They heed the insistent and repeated urging by Pope Francis for the Catholic Church to go out, away from her shell and towards the peripheries of the world. They will be working on the edge of the enormous metropolis of Mexico City, in a shantytown called Cartolandia, built alongside the railroad tracks of La Bestia (the Beast) cargo train that transports goods into the United States. Desperate people, living in these makeshift abodes of cardboard (hence the nickname Cartolandia) and plastic and cloth and cheap plywood, hop on La Bestia hoping to enter into the United States illegally. 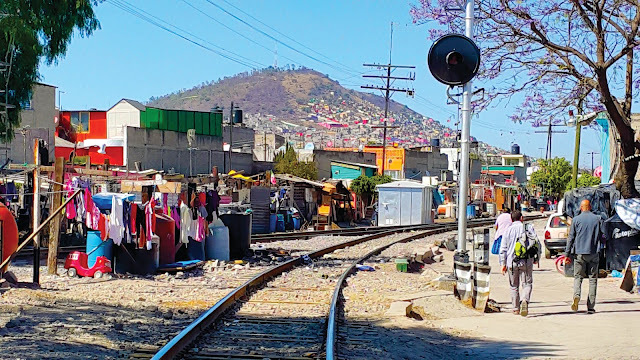 Our missionaries hope to bring God’s Word of Life to these most vulnerable and destitute, who have come down from the mountains and stay at Cartolandia while waiting for their turn to hop on La Bestia. Our missionaries want to peach to them the Word that can heal their deepest wounds, can bring comfort, can educate, can abide in the hearts of this segment of humanity clamoring for basic rights and for dignity, both of which have so far been denied to them by their local government who ignores them. But they will learn our God loves them. This new mission of PIME in Mexico will be an expression of God’s presence among the anawim Yhaweh, “His poor.” It will be a presence meant to enrich those who are totally dispossessed, and rekindle hope in those who have been repeatedly crushed. In the deep wounds of these emarginated people, our missionaries must sow reconciliation and compassion where the urge for vengeance is so fierce. It must be a type of mercy that covers more than mere clemency and forgiveness. It must be mercy born of truth and justice. These Mexicans need shepherds who feel comfortable handling whatever comes along in the ordinariness of daily life. These Mexicans need shepherds who do more than simply consoling the victims of violence. They need shepherds who dare to rebuke the perpetrators of violence and injustices. These Mexicans need shepherds who can go beyond preaching forgiveness and mercy. They need shepherds who, with courage, demand a radical change of life and true conversion. People are genuinely excited about the imminent visit of the Supreme Pontiff. They have great expectations and hopes. The feeling is almost palpable, the deep-seated desire to turn the page where the narrative has been of violence, drug trafficking and impunity. Clearly, it is the desire to break the vicious cycle of corruption. They are all tired of thefts, kidnappings and extortion, and the arrogance and the hubris of the malefactors, who prosper on the grief of common folks. Mexicans impatiently long for the day in which “love and truth will meet; justice and peace will kiss.” (Psalm 85: 11). A Mexican country without violence is possible. We all ought to believe it possible and, then all work together to build it! The PIME Missionaries are Catholic priests and brothers who commit themselves to lifelong missionary services, but they can’t do alone. Will you help PIME Missionaries make a difference in crossing cultures and transforming lives through the Gospel?